When do you write tout, tous, toute ou toutes ? When is the S of “tous” pronounced: when is it “tousss” or “tou”? The reason why “tous” is pronounced differently is grammatical. The word “tout” has different grammatical values in French : it can be an indefinite adjective, an adverb, a noun, an indefinite pronoun or a neutral pronoun. In this article, I’ll explain “everything” (pun intended) clearly, with many examples. I’ll start this lesson with a tip on when to pronounce the S of “Tous”. 1 – When do you Pronounce the S of Tous ? This is a shortcut: I’m sure you’ll find examples when this doesn’t work, but it will help you out. Tout – spelled this way, with a T at the end, is always pronounced “too”. Toute and Toutes – so Te or Tes at the end, are always pronounced “toot”. The T is pronounced because it is followed by a vowel. The E and the S are silent. If you don’t understand what a liaison is or why the final E and S are silent, you should study French pronunciation, since this is pretty basic. Now if you want to understand why you pronounce (or not) the S of “tous”, read the explanation below – it’s not that hard to follow, I promise! A – What is an “Indefinite” Adjective? An adjective is a word which adds some meaning to another word, usually a noun or a pronoun. Like a color for example. “Indefinite” is a grammatical term which means “non-specific”. So, as an adjective, “blue” for example is quite specific. “Most” or “several” are examples of indefinite adjectives in English. They give a notion of quantity, but it’s not specific. When used as an indefinite adjective, “tout” modifies a noun, introduced (or not) by an article, a possessive or demonstrative adjective, or a pronoun. A – What is an Indefinite Pronoun? A pronoun is a word which replaces another word, usually a noun. For example, instead of repeating my name “Camille”, I use the subject pronoun “I”. I could also use “Me”, another kind of pronoun. Knowing the grammatical function of the word you want to replace is key to choosing the right pronoun. Translating English to French is not going to work: you first need to know “what” (meaning the grammar role of the word) you want to replace. Read my blog article about French pronouns to understand this concept better. And we talked about “indefinite” above: it means non-specific. It means “everyone” or “all of us, all of them, all of you”, and always replaces several persons (not one person, and not things). These pronouns often go after a verb. “Le tout” is a masculine noun meaning “the whole thing”, “the entire thing”. Le tout représente beaucoup d’argent – the whole thing adds up to be a lot of money. Now you pretty much know all you really need to know about “tout” and its pronunciation. When used as a neutral pronoun, “tout” replaces a thing, never a person. “Tout” – neutral pronoun – has only one form: “tout” pronounced “too”. An adverb is yet another word which modifies a word! An adverb doesn’t modify a noun or pronoun (adjectives do). An adverb modifies a verb (it “ads” to the verb, like “quickly” in English), an adjective or another adverb. “Tout” is used as an adverb when it is in front of an adjective (except possessive and demonstrative adjectives, as seen above, in this case “tout” is an indefinite adjective) or another adverb. As an adverb, “tout” is invariable, it has only one form: “tout” pronounced “too”. Note that when “tout” comes before a feminine adjective starting with a consonant or a pronounced H, then it becomes “toute” or “toutes”, both pronounced “toot”. This is a big exception for an adverb, which usually has only one form, and quite an advanced and confusing concept (I am positive most French people don’t know that rule). Elles sont toutes contentes d’être ici – they are absolutely happy to be here. Ils sont tous contents d’être ici – all of them are happy to be here. “Tous” is an indefinite pronoun, it replaces a bunch a people and it’s pronounced “toos“. Ils sont tout contents d’être ici – they are extremely happy to be here. “Tout” is an adverb, it modifies the adjective “contents” and it’s pronounced “too”. When “tout” is followed by “de”, and we speak fast, the two words are going to glide together and sound like “toot”, making it sound like you said “toute(s)”.. Confusing right? Maintenant, vous savez tout sur tout !! 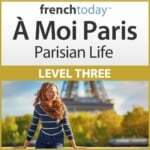 Tout is explained in depth, with audio, many examples, exercises and then illustrated by a story (loaded with “tout” examples in context) in my French learning audio method À Moi Paris level 3. For this concept as in everything in French, I believe that learning in context is super important: you need to develop a sense, an “ear” for “tout” and its pronunciation. When the French speak French, they don’t analyse the grammatical structure of the sentence! We don’t know whether we’re using a pronoun, an adjective or an adverb! We just know the correct pronunciation of “tous” (too or toos), because we’ve repeated the sentences enough that we know what sounds right. Once you’ve understood the grammar rules, you too need to develop your French ear. And French Today’s audiobooks are the best way to do it!